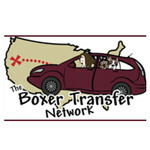 The Boxer Transfer Network hasn't added a story. Claire, like thousands of other cats, has lived her whole life outside. She has been living under the porch of an elderly man that had been feeding her. But when she began having kittens and the number of cats started to rapidly increase, the man had a change of heart. He stopped providing food hoping the cats would move elsewhere, but they didn't. A neighbor ultimately stepped in one day when it became clear the cats were no longer safe, and she and her daughter Kayla set live traps. At this point there were 2 litters of kittens and mom. All the kittens were trapped, but mom would not go anywhere near the trap. Kayla kept 3 kittens, found homes and rescue for the rest, and continued to try, unsuccessfully, to trap Sassy, who was very distraught at her kittens being taken away. Her plan was to have Claire spayed and find her a home. She's been trying to earn Claire's trust and she has warmed up, although she is very cautious. But now Kayla feels she is pregnant again and doesn't want her to have yet another litter of kittens outdoors and she ask if we could help. I agreed to help find a foster and Sara Grossarth stepped up. Sara adopted Tierney, fka Bullet. We need funds to help with vet care for Claire and her babies. Claire will need some tests before going to Sara as Sara has other cats we have to protect, and she'll need to be spayed once she's through nursing. And kittens eat a lot of food, use a lot of litter, and will also need vet care before being put up for adoption. Please help with any donation possible. No amount is too small. For those that can't foster, this is a great way to help make a difference. The Boxer Transfer Network hasn't posted any updates yet. The Boxer Transfer Network is managing the funds for this campaign.